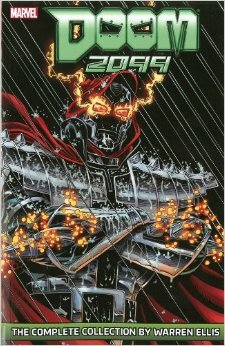 Doom returns to Latveria shaken by the revelation that there is another Victor von Doom. His doubts over his own identity deepen and he begins to quest for the truth. First he consults with Fortune and her tarot. Then he has Wire attempt to back into Myridia, the place where L'Argent got his information about the Shadow Doom. As he does so, unbeknownst to him, he is being observed by the woman, Margaretta and the Shadow Doom. Doom decides to visit the island nation of Myridia. Upon arrival Doom requests an audience with Myridia's ruler, General Tibor Czerny. While Doom meets with the General, Wire explores the city. However, Wire quickly becomes a target for a mysterious shadowy figure who turns out to be Duke Stratosphere. Meanwhile, Doom comes face to face with the General. Once a young and virile military man, the General is now kept alive in a symbiotic relationship with the country he built. Doom tells the General he wants Myridia for himself. After threatening to release an EMP which would devastate the nation's information network, the General reluctantly agrees. Meanwhile, in an island fortress in the South Pacific, Tiger Wylde is resurrected by the Shadow Doom. General Czerny mentions that Doom has been to Myridia before. 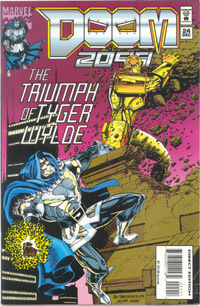 The Shadow Doom claims he gave Tiger Wylde Latveria...possibly meaning he orchestrated his rise to power there. A missile strikes the capitol city of Myridia. From the rubble which is creates emerges a resurrected Tiger Wylde. Once partly human, he is entirely robotic now and he yearns for revenge against Doom. Elsewhere in the capitol, the General explains that when Doom reappeared and overthrew Tiger Wylde, he channeled the resources of Myridia to uncover as much as it could about him. When Doom asks what he discovered, the General tells Doom of his son, Erick, and his obsession with a cabal of shadows who have manipulated world events. These shadows have supposedly orchestrated the social and political crisis' of recent years. In another part of the city, Wire awakens to find Duke Stratosphere watching over him. Surprised by this rare real-life meeting, Wire asks to know what he wants with him now. The Duke has Wire plug into cyberspace to view a file he found in the wastelands. The file contains a complete download of Doom's life. Duke explains that the file can be imprinted onto someone's mind and make that person programmed to believe they are the real Doctor Doom. Wire suddenly realizes that he could be with an imposter. After raising havoc in the streets, Tiger Wylde storms into the underground chamber housing the General and Doom. The two engage and after a hard-fought battle, Doom manages to defeat Wylde a second time. However during the battle, the General's life support systems were damaged. 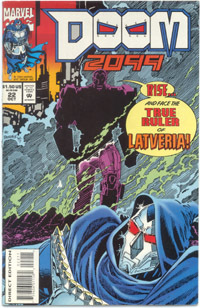 In order to save Myridia, Doom programs the city computers to believe he is still alive. Accompanied by Wire, Doom then leaves to seek out Margaretta and the other Doctor Doom. As the floating city takes its course, Tiger Wylde emerges on the hull of the city. The General states that Margaretta is in fact much older than she appears and that she has prolonged her life by switching bodies. Using Valhalla's weather altering functions, Doom uncovers a hidden fortress in the Pacific Ocean. As the fortress attacks, Tiger Wylde clings to the hull of the floating city. One of the missiles knocks him off and he plunges downward. Meanwhile, Doom and Wire likewise use a drop ship to land on the fortress as the automatic defenses of the fortress and Valhalla fight it out. In Latveria, Poet brings Fortune to a remote place and introduces her to the Neon Angel. The Angel offers to cure Kaz in exchange for her coming under her employ. In the Pacific, Doom and Wire penetrate the wall of the fortress and explore. Inside they find that the walls of the structure are made of data storage devices. The places is built on information and secrets. They also find old servitor robots which Doom recognizes are of his own design. Spotting a cyber-deck, Wire suggests he plug in and download the plans to the building. Entering cyberspace, Wire instantly senses that the net is different somehow. Suddenly he is attacked and killed. In the real world, Doom holds his body, now lifeless. Margaretta then emerges from the shadows. Doom is suddenly filled with a dim memory that he once loved this woman, but also competed with her. She tells him that their game was chess, and all the world was their board with pawns. Her pawn, Tiger Wylde, bursts in and attack Doom. Their fight brings them into a lab where Doom recognizes a Time Platform. He uses the device to fling half of him into the past and thereby severing him. A figure emerges which Doom denies upon seeing. The figure identifies himself as Doctor Doom. The servitor robots which Doom and Wire find are similar in appearance to the classic Servitor-Class Doombots often seen in the pages of the Fantastic Four. 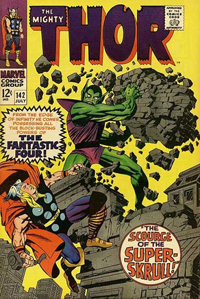 In the Pacific Fortress of Margaretta and the Shadow Doom who claims to be Doctor Doom, Margaretta observes as the two Dooms battle one another. The two Dooms are then thrust into the past via the lab's time platform. They appear in Latveria where their battle is observed by Werner von Doom. The image of the iron-masked men battling indelibly imprinted in the child's memory. As the two fight, the Shadow Doom reveals he carries a remote control for the Time Platform. The two are then transported to 1942 and are attacked by German soldiers. Then they appear briefly as ghostly specters to Thing in the present day. Again and again, the pair battle across time. In cyberspace, data coalesces and takes the shape of Wire. Though no longer connected to his real world body, Wire lives again in Cyberspace. 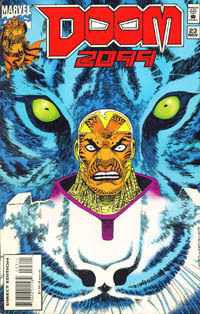 In the time stream, the two Dooms are randomly dumped in the year 2089. There the two observe events in the Pacific fortress invisibly. They see another Doom emerge from a teleport, his armor is damaged and he is severely wounded. Margaretta is there and calls this man "my Doom." While her Doom is regenerated, also in the lab is Erik Czerny. The two Dooms observe that Erik is implanted with Doom's memories and then given the armor of the Shadow Doom. The Shadow Doom becomes unstable as the truth dawns on him that he is in fact Erik, the imposter. Doom takes advantage of his confusion and takes control of his armor, therefore gaining control of his remote for the time platform. 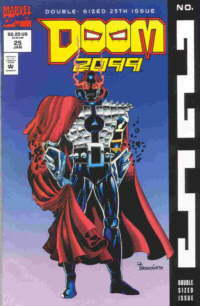 Before returning to 2099, Doom also takes with him the armor he wore in 2089. Back in 2099, Doom confronts Margaretta, she admits that she released him with Erik's memories mixed with his own, in order to make the game more of a challenge. Doom is not amused, and tells her that he does not play games. But in any case, he advises her that the Shadow Doom's armor has made the Time Platform unstable. Her final challenge will be to somehow escape her own fortress. Time quakes then erupt and erase the fortress as if it had never existed. Aboard Valhalla, Doom dons his reclaimed armor and savors his victory. Margaretta's full name is revealed as Margaretta von Geisterstadt. Geisterstadt is German for "Ghost Town." As Doom and the Shadow Doom are thrown through the time stream, we are given glimpses of familiar scenes from other Marvel futures: Wolverine being blasted by a Sentinel [Days of the Future Past] and a fleet of Iron Men [Iron Man 2020]. Mr. Fantastic and The Thing make a brief appearance. 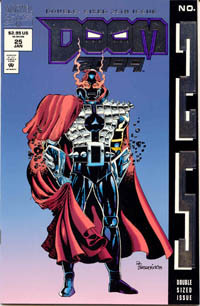 First appearance of Mark-2 armor.